Difficulty Notes: A fall on the crux (traverse from Kent Ridge to Inflexible) would severely injure so take necessary precautions. Kent Ridge on its own is an easy scramble. 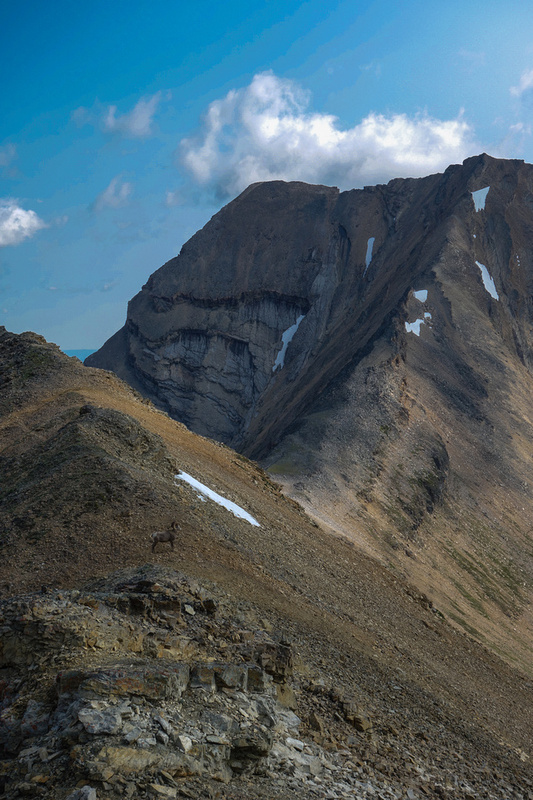 Find the faint trail running past the outhouse, north. 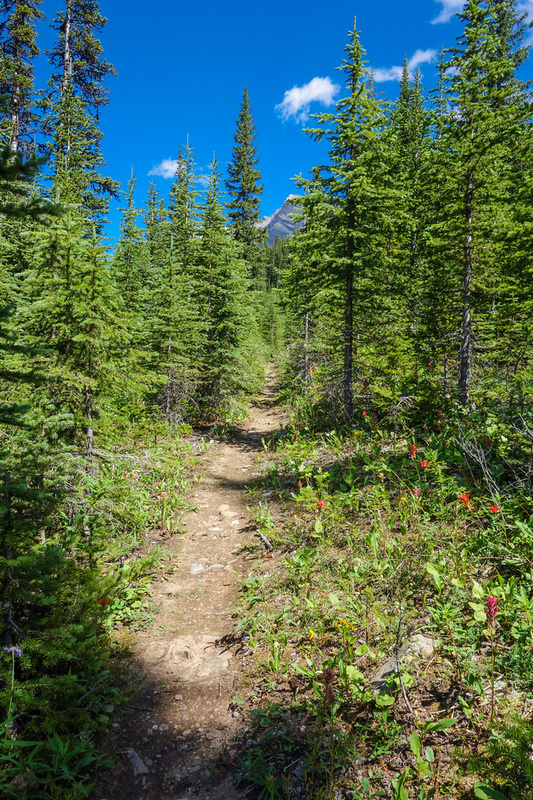 Take this trail and you’ll soon run into a gate on an old logging road, take this road a short ways until it branches. Take the left branch. This left branch heads west before going uphill to the north / west. 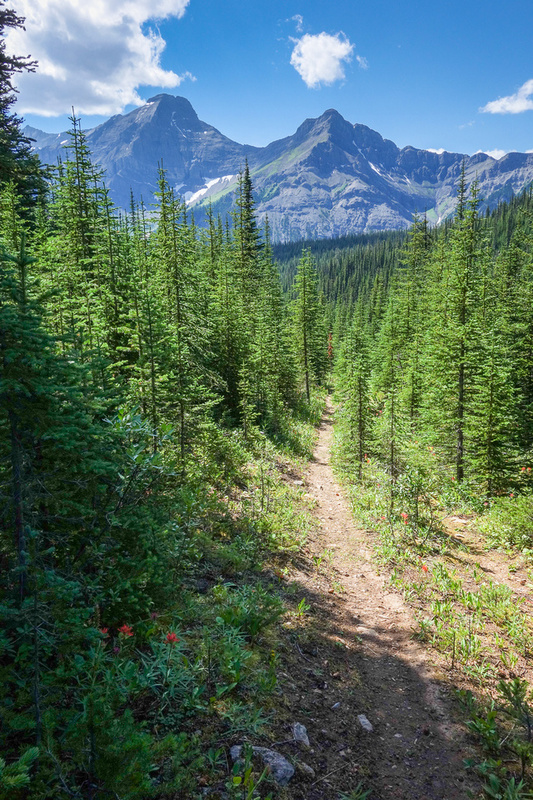 Eventually you’ll come to another logging road running east/west. Follow this road west (climber’s left). At the next junction the trail either keeps going straight or you can take a branch left, slightly descending. 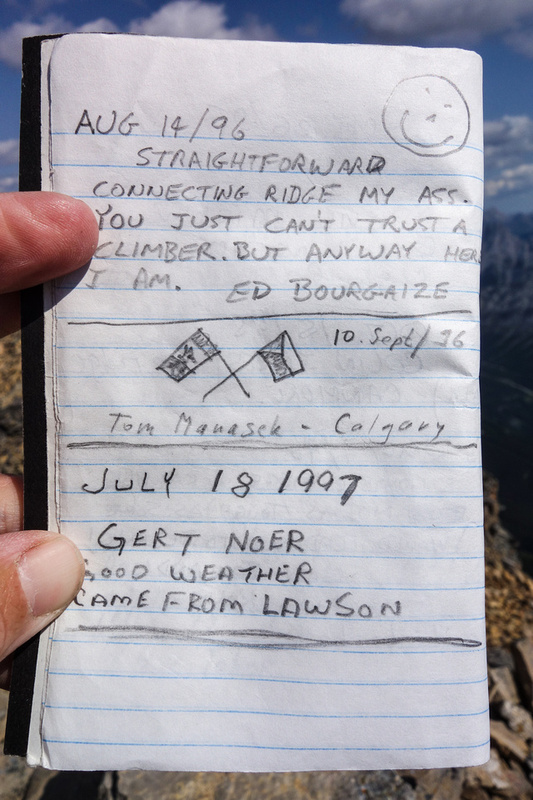 Take the climber’s right fork (cairn when I was there) – now you’re on the trail to James Walker pond and peak. Morning views off Kent Ridge’s lower slopes looking towards Mount Birdwood. 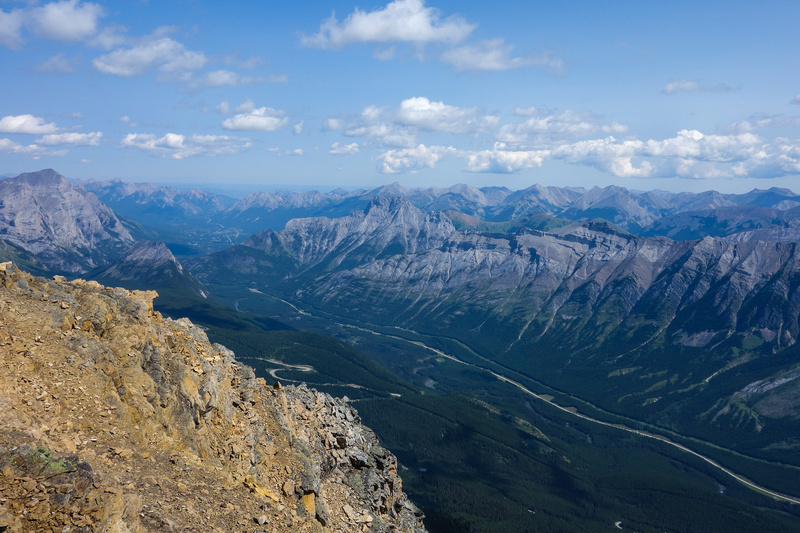 Looking ahead to Kent Ridge from near the summit of the SW outlier. The west slopes of the ridge were a bit loose and scrambly but once I finally hit the ridge, things improved a bit. The view behind me was certainly opening up nicely. At the summit of the outlier I had a rather depressing moment of looking down at the outlier / Kent Ridge col and the elevation loss involved. I’m still not sure if I can claim the “SW outlier” as a separate peak or not. I think not, but if Nugara lists it in his book I’ll have no other choice. Looking back at the north outlier from the col. I purposely measured the elevation difference to the col and came at about 75 meters – just short of the requisite 100 to validate claiming a third peak for the day. Bummer. It was at the col that the mosquitoes decided they had me exactly where they wanted me and the bloodletting began!!! 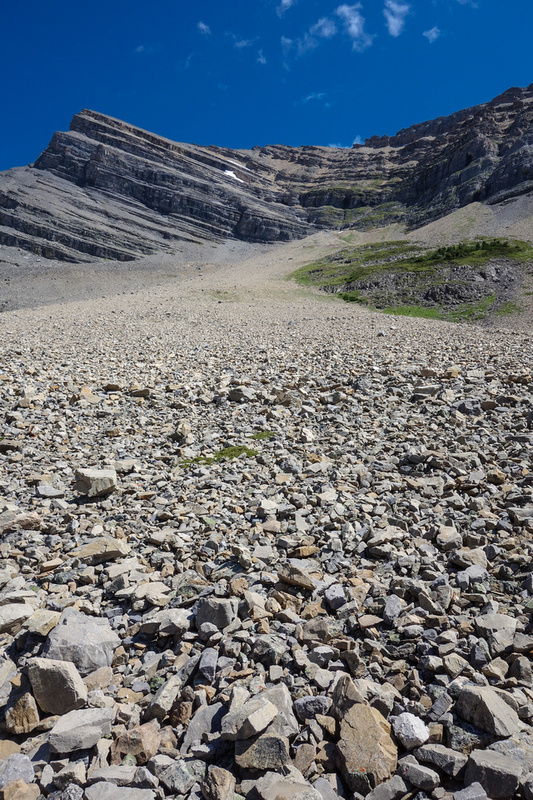 The little buggers were horrible and I tried to outpace them up the scree slope to Kent Ridge. Eventually they gave up trying to bite through the deet, but even then there was so many that I was breathing them in, which got annoying after a few minutes. 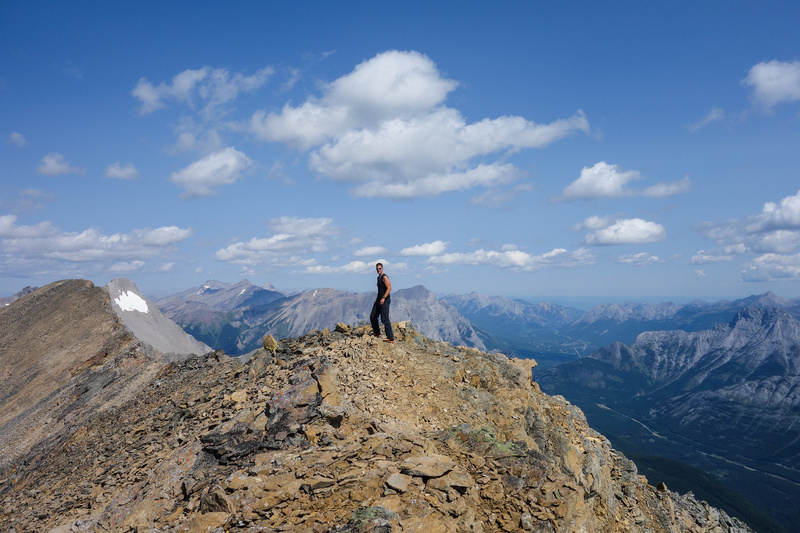 By the time I arrived at the summit of Kent Ridge the mosquitoes were all but gone again. 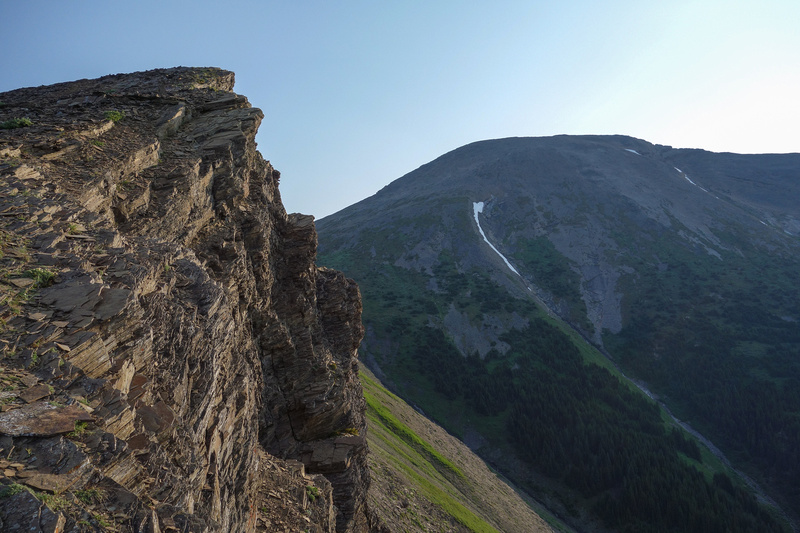 Pano looking back at the ascent route for Kent Ridge at the north outlier. 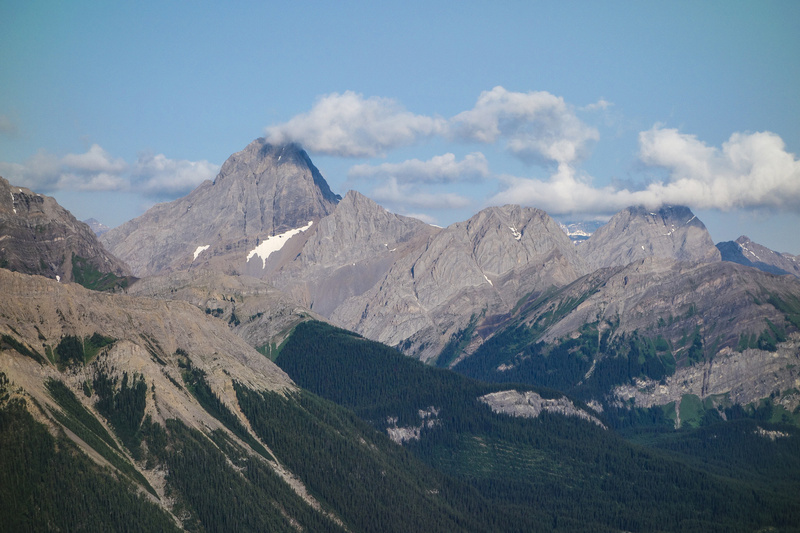 Mount French, Smith Dorrien and Sir Douglas in the background. Summit cairn of Kent Ridge with Mount Inflexible in the background. Panorama looking towards Mount Chester, James Walker and Inflexible on the far right. The views were great in all directions. 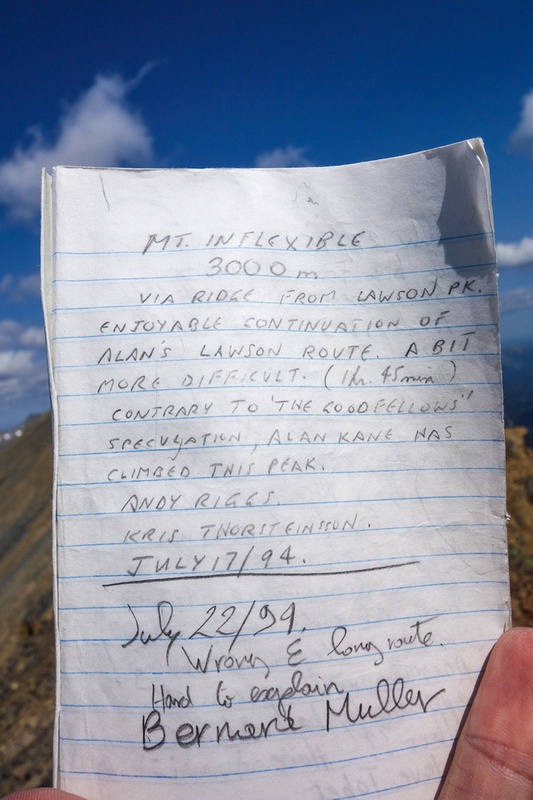 I took some photos, signed the register and scoped out the route to Inflexible. 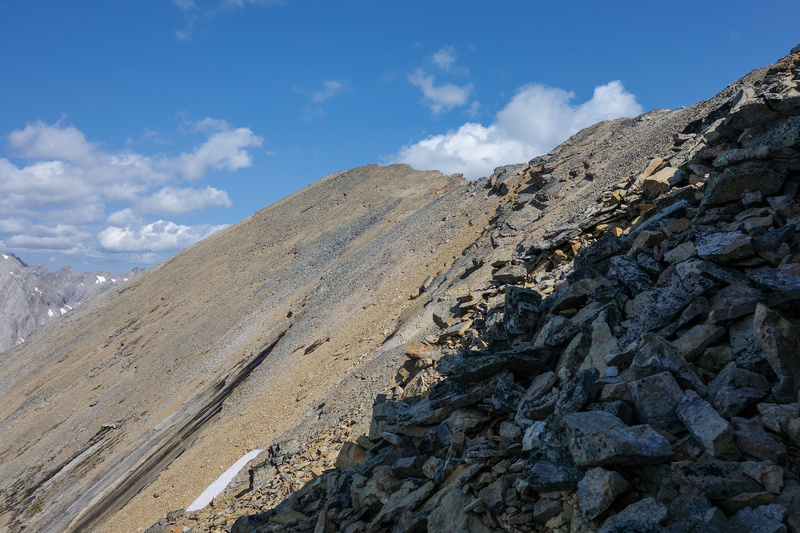 It looked very reasonable from this vantage and I became pretty confident in making my goal of 8 hours and not exceeding moderate scrambling. Only 5 minutes later I wasn’t so sure anymore. 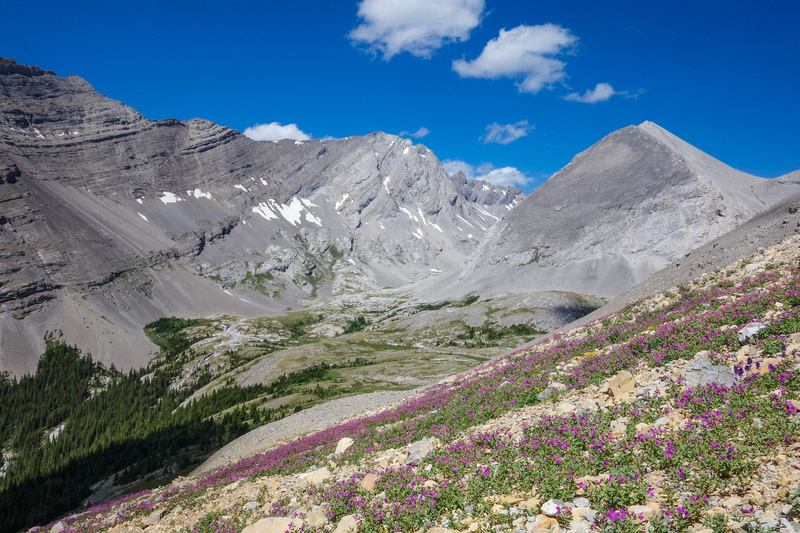 The slopes to gain the ridge of the SW outlier are a strange mix of scree, plates of rock and wild flowers. At least the mosquitos weren't out yet. Looking back as I gain the ridge to the SW outlier. The parking lot at center bottom. Mount Birdwood across the valley. Summit cairn on the SW outlier looking down at the ridge. Looking up towards James Walker (R) with Chester on the left and an unnamed peak at center. 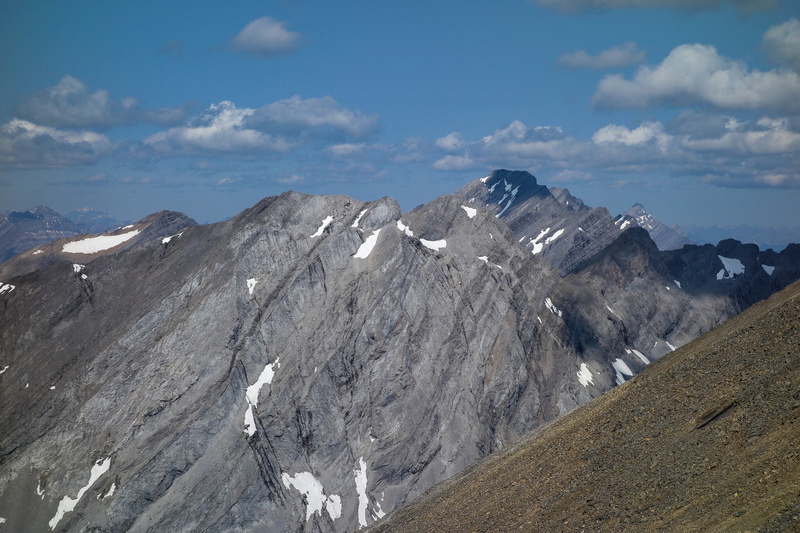 Summit panorama from the outlier looking back at the ascent route. 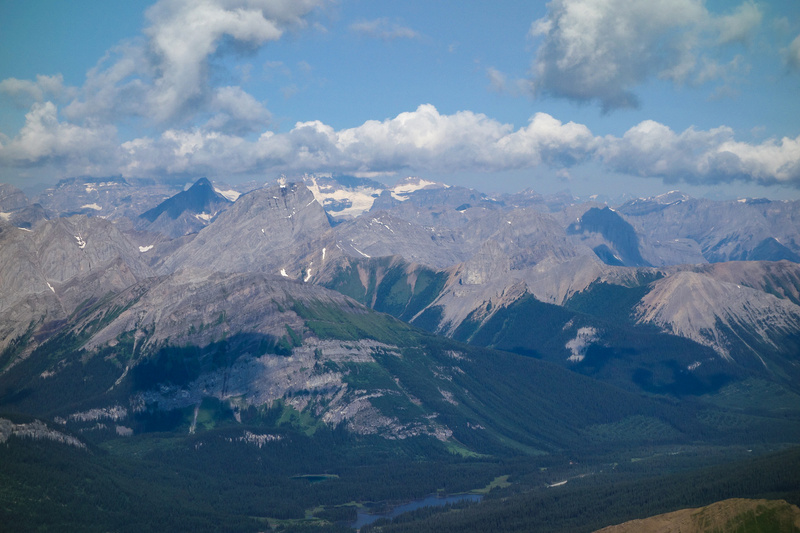 Panorama from the ridge includes, French, Murray, CEGFNS, Burstall, Birdwood, Commonwealth, Commonwealth Ridge and Mount Chester (L to R). 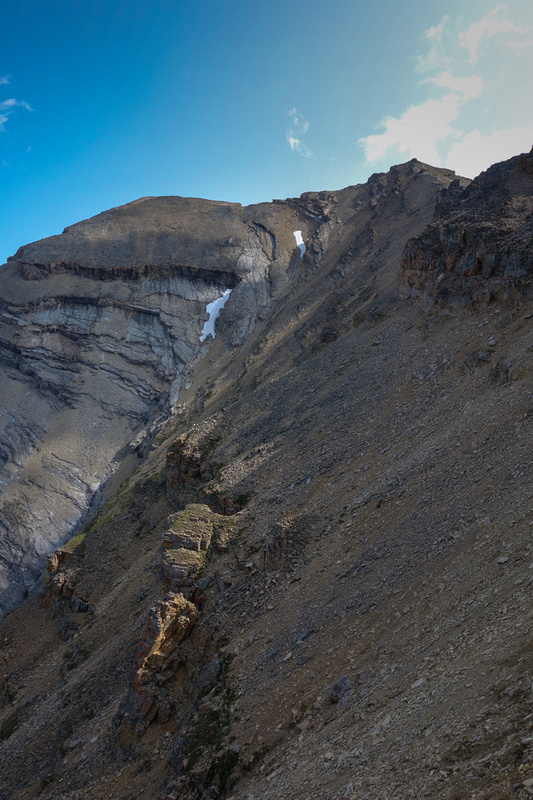 Pano looking back at the ascent route for Kent Ridge at the north outlier. 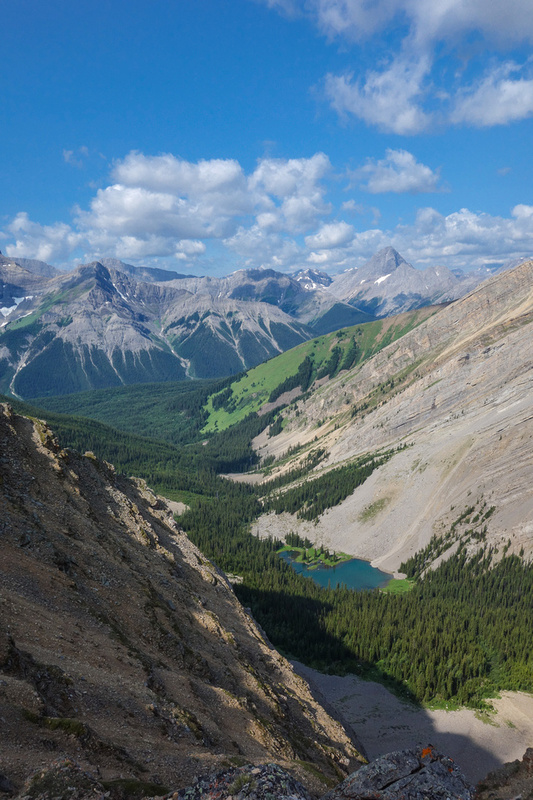 Looking across the Spray Lakes road to Mount French and Smith Dorrien. 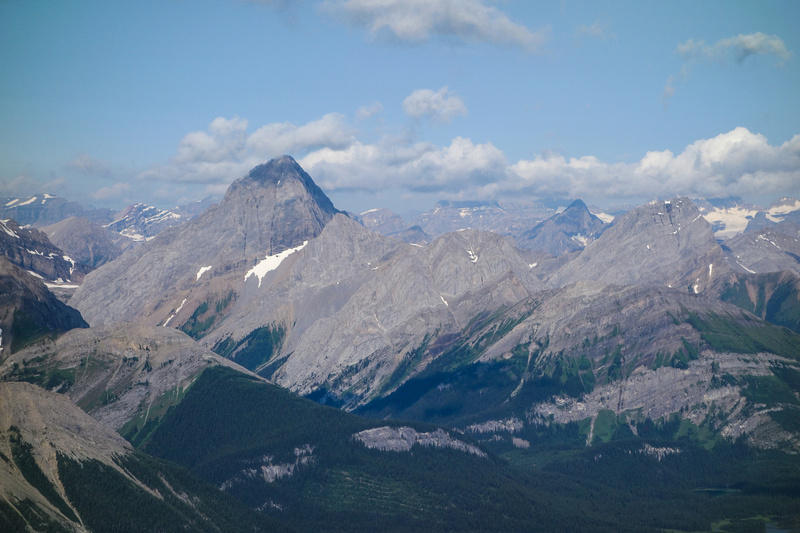 Mounts Sarrail and Joffre across the Kananaskis Lakes region. Mud Lake visible at lower right with Commonwealth Ridge, Peak and Birdwood to the left. Summit view from Kent Ridge to Mount Inflexible. 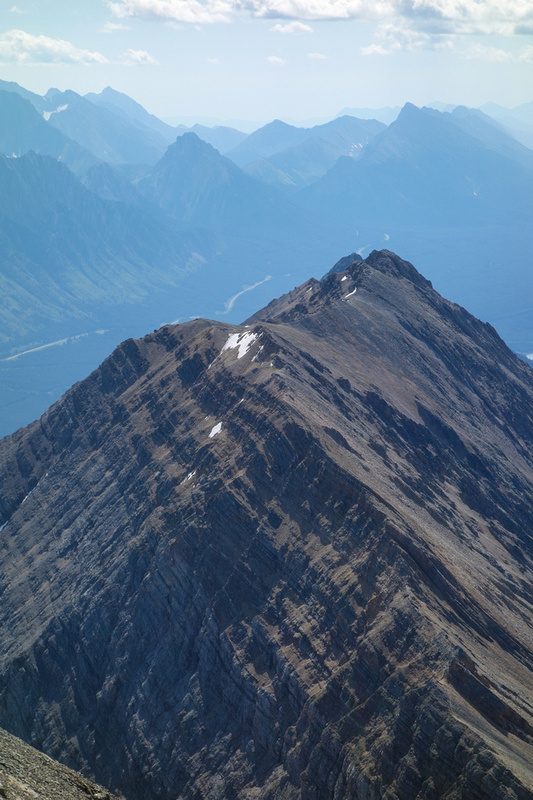 The ridge continues to Mount Inflexible - looks very easy from this angle. View into the James Walker bowl with both scramble routes to the summit visible. 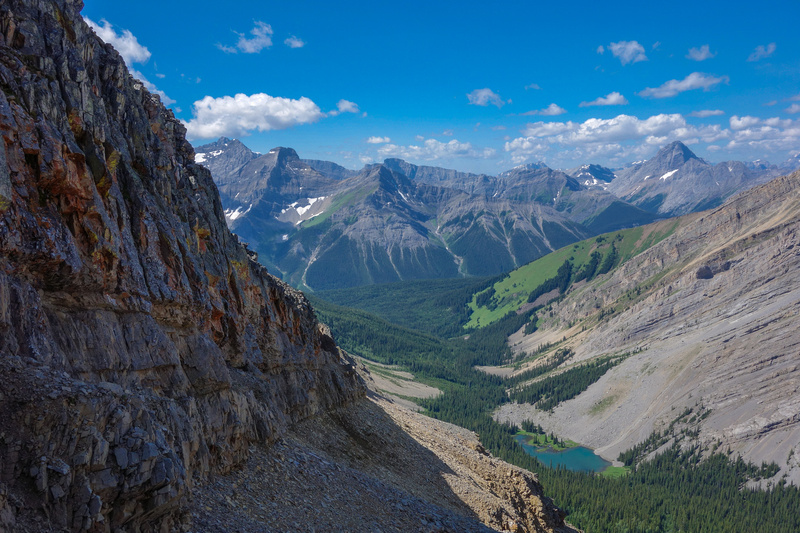 Looking into the valley between Kent Ridge and Mount Inflexible - beautiful view!! 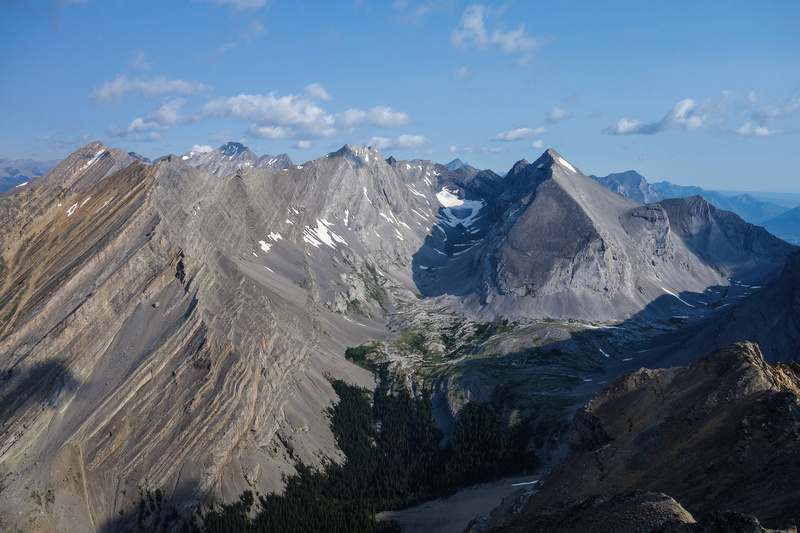 Another panorama, this one looking south towards Kananaskis Lake and west towards the Haig Icefield. Inflexible is an impressive peak. Close up of both routes on James Walker at center and around to the right. Sir Douglas hides in clouds beyond Mount Birdwood. 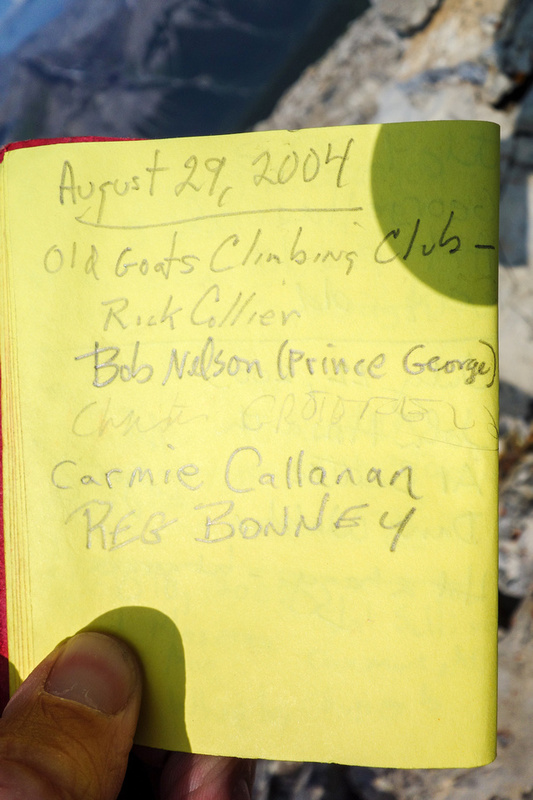 The summit register is an interesting collection of names. Shortly after leaving Kent Ridge in high spirits I was doubting my route choice to Inflexible. It was looking rather inflexible from my vantage. I believe that the discrepancy in trip reports regarding the difficulty of the traverse is simple. The traverse from Inflexible towards Kent Ridge is quite a bit easier than the traverse in the opposite direction. 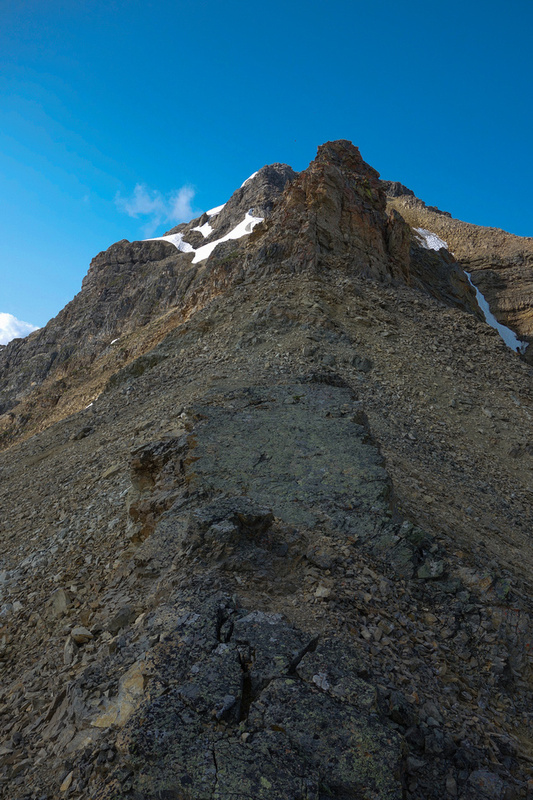 This is due to two things, the easiest route from Kent Ridge to the Inflexible col is hard to spot from above, and the terrain is very loose and exposed when you get off route, therefore the ridge is much easier to ascend than descend. From the summit of Kent Ridge the traverse over to Inflexible doesn’t look that involved. 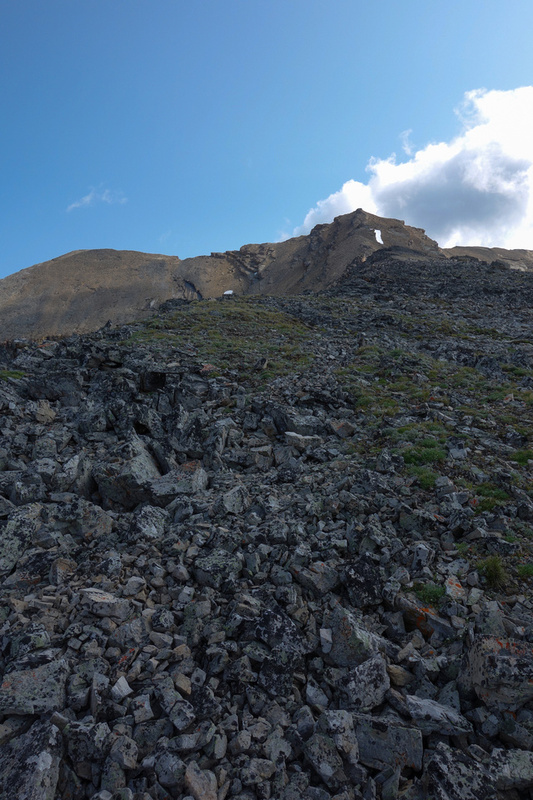 Looking back at a section of ridge just under the summit of Kent Ridge – loose! Generally I managed to find easier lines on the left (west) side of the ridge, but every once in a while I got suckered onto the right side. 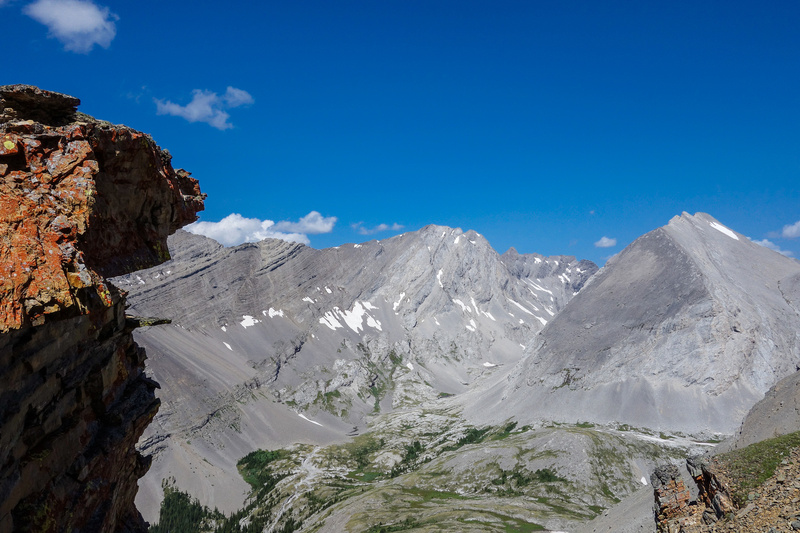 There were a few spots where I was on down sloping slabs with very loose ‘holds’ and nothing but air beneath me which did not make me too happy. But the day was beautiful and I still had plenty of time so I decided to slow down and choose my line carefully. Soon I found myself avoiding all the drop offs on the ridge proper by dropping down onto a wide scree ledge on the west (skier’s left) side. 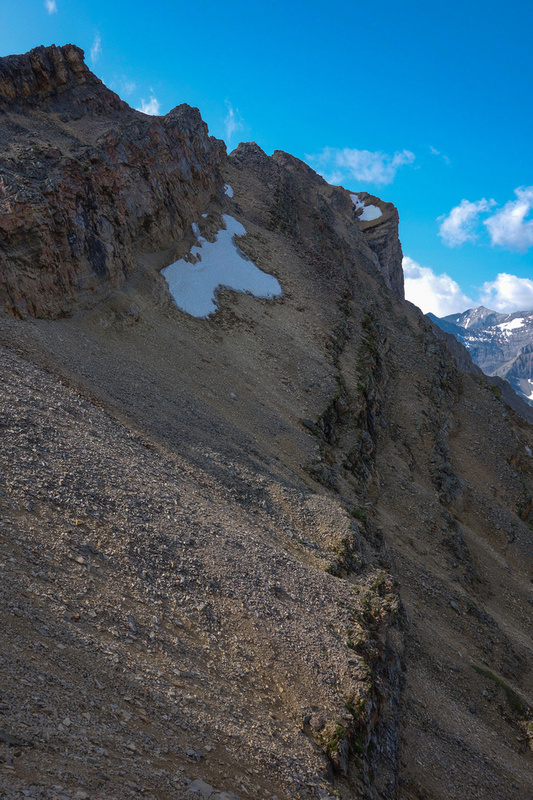 I followed this ledge down a long ways (about 50 feet under the ridge crest) until I suspected I was lower than the col. At this point I scrambled up loose scree to the col – about 1 hour after leaving the summit of Kent Ridge. From the col the scrambling was easy to the summit of Inflexible. 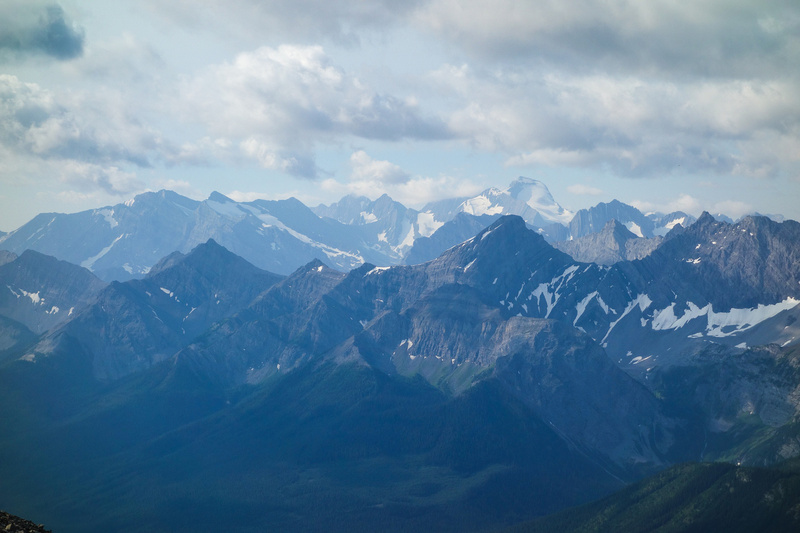 A view of the pristine Kent Creek Valley – this time right from the summit and even including James Walker Tarn at lower right. 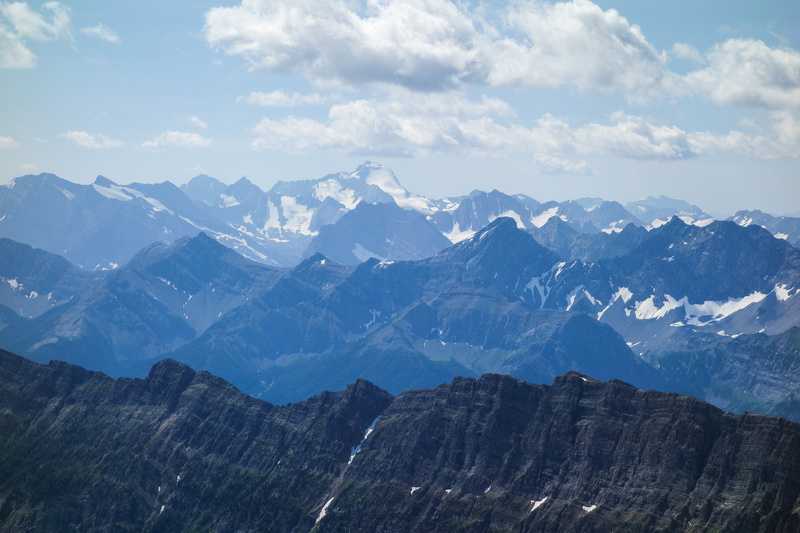 The views at the summit were awesome – as expected. I was surprised at the height of Inflexible compared to Lawson. Lawson looked a lot lower than I remembered it feeling! 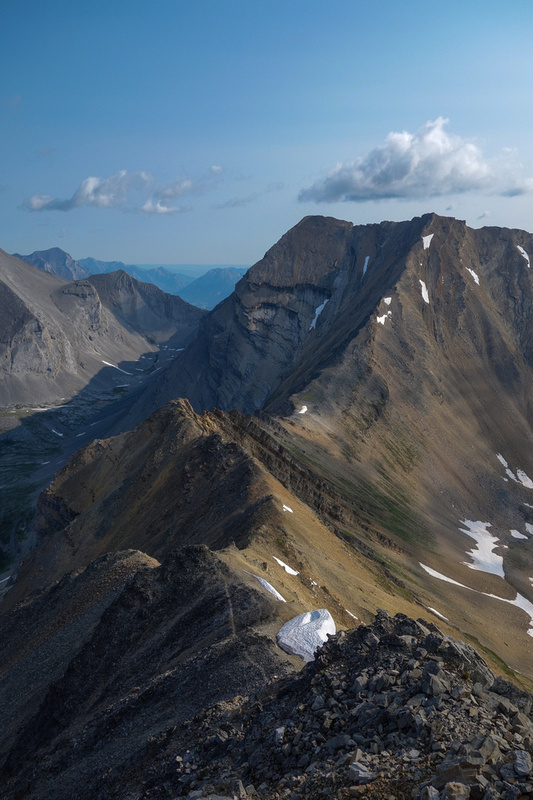 The ridge from Lawson looked like it’s probably comparable to the ridge underneath Kent Ridge to the col – some down sloping slabs, loose holds and exposure. 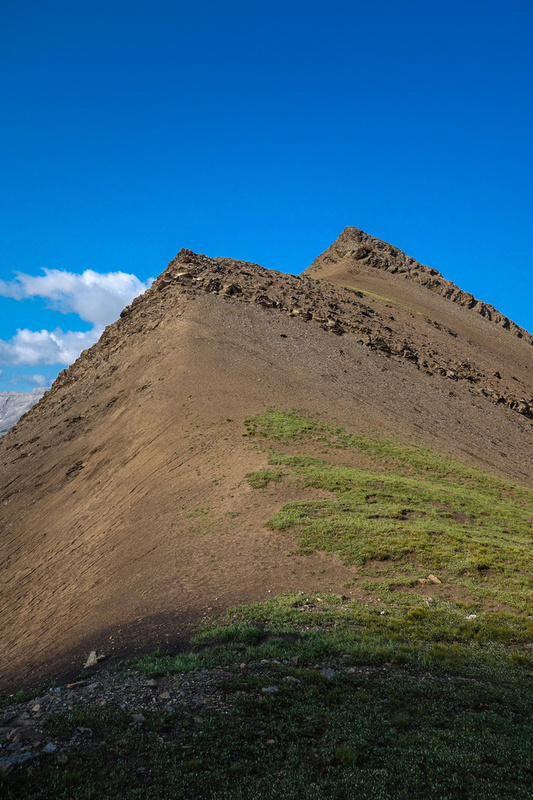 The summit ridge to the slightly higher north summit wasn’t a problem either. Reading the register was quite funny. Climber’s didn’t find the traverse from Lawson very hard, while scramblers and hikers didn’t appreciate Kane’s suggestion to try it at all! Looking at the north summit – with James Walker behind at left and hwy 40 far below at right. After snapping pictures and hydrating it was time to head back. I really struggled with my route choice back to the parking lot. I knew that Raf had managed to negotiate the slopes to the James Walker valley / approach trail but I also knew it was a route-finding challenge and very steep and loose. 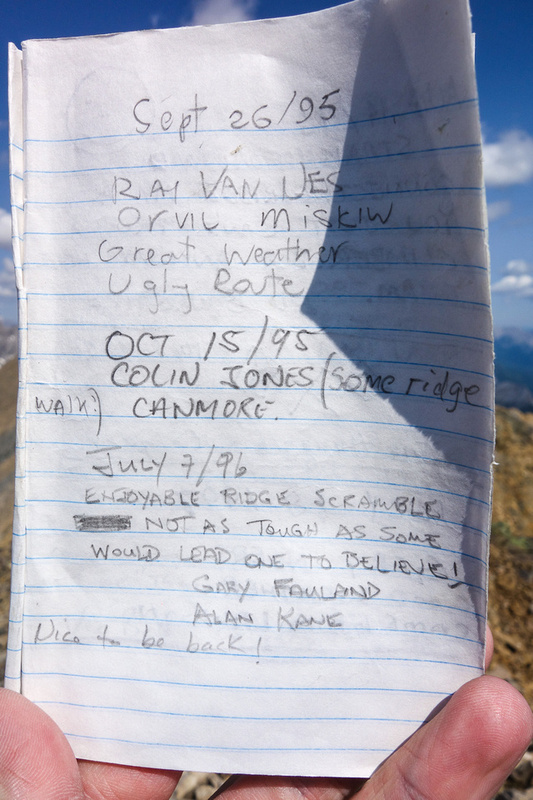 I also knew (from the summit register) that some guy had recently scrambled up from that approach. 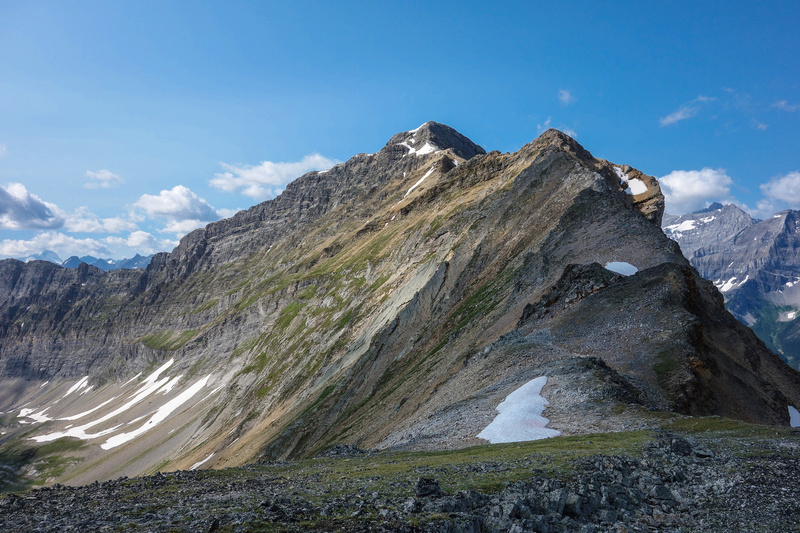 On the other hand I also knew that I could quite easily ascend the route back up to Kent Ridge – the issue there being the extra height gain as opposed to exiting on a nice trail via James Walker Creek. 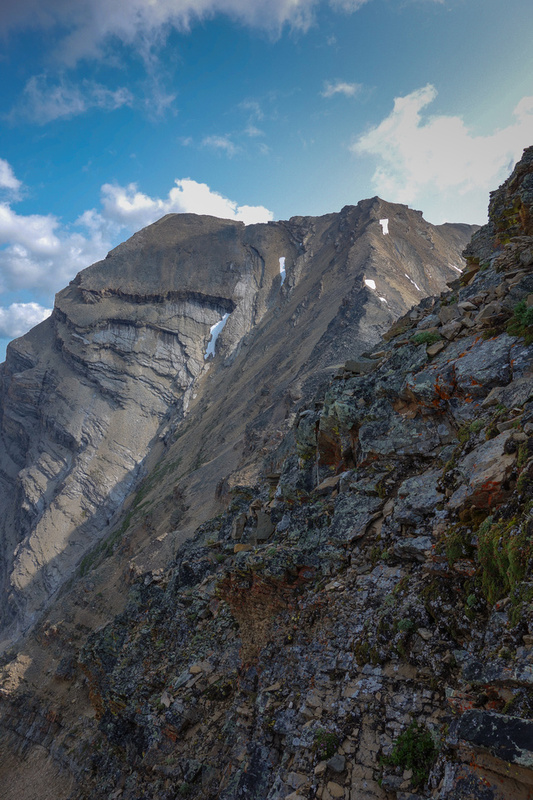 I decided to try descending the west face of the ridge from the Kent Ridge / Inflexible col. 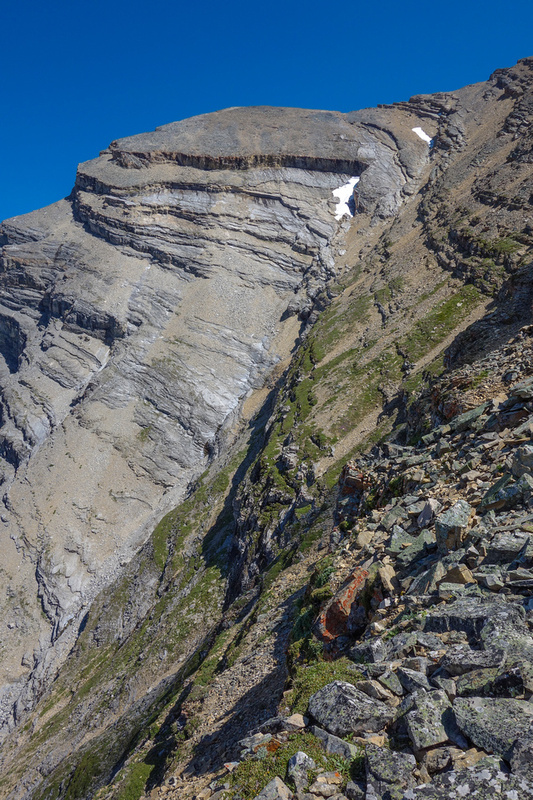 Looking back at a particularly large and long scree ledge I followed from just before getting down to the col on descent. The descent to the low point on the ridge was easy enough. 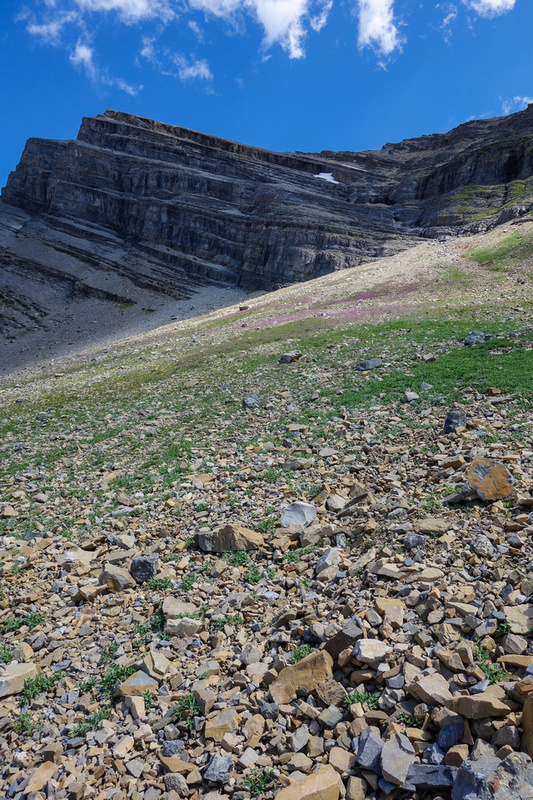 From there I bashed my way down scree ledges, always searching back and forth for an easy break through low cliffs to the next scree or grassy ledge. This worked well up high, but as I worked my way lower on the face I began to worry. 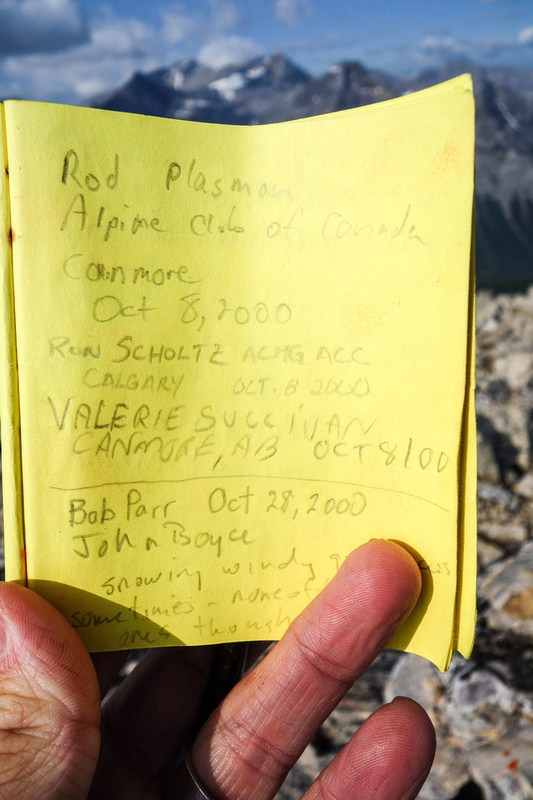 I was taking a long time to find reasonable scramble routes through the cliff bands and time was ticking! I really started to think I was going to get completely cliffed out but I trusted my gut and eventually managed to step off the face and start down the scree piles towards the small tarn and hopefully a well established trail. The rest of my route down to the James Walker Creek is obvious. 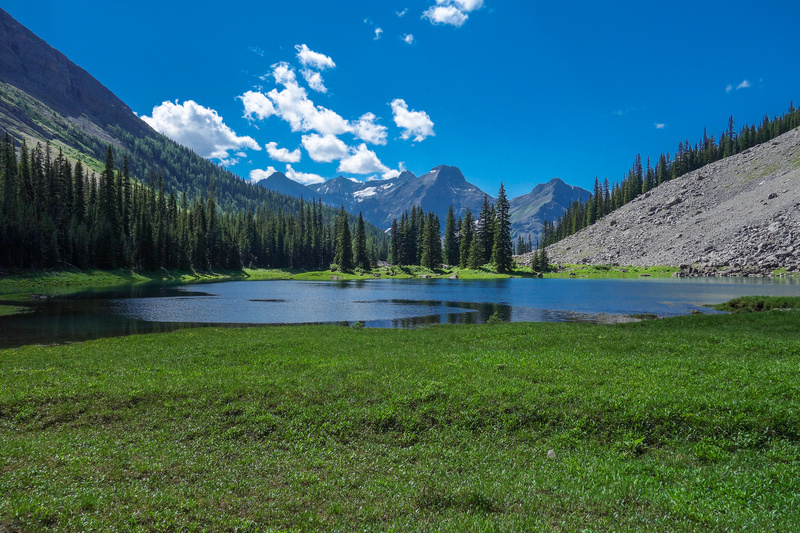 I should have gone straight west to the trail but I angled down the valley and ended up doing some moderate bush whacking around the tarn before finally settling onto an excellent trail which I followed to the parking lot. I made it to my truck 7.5 hours after leaving it – a pretty decent time I thought, considering the route-finding issues and total height gain for the day. I highly recommend this trip. I don’t particularly recommend the ‘shortcut’ down the west slope from the col to the James Walker trail unless you’re really determined to try it. 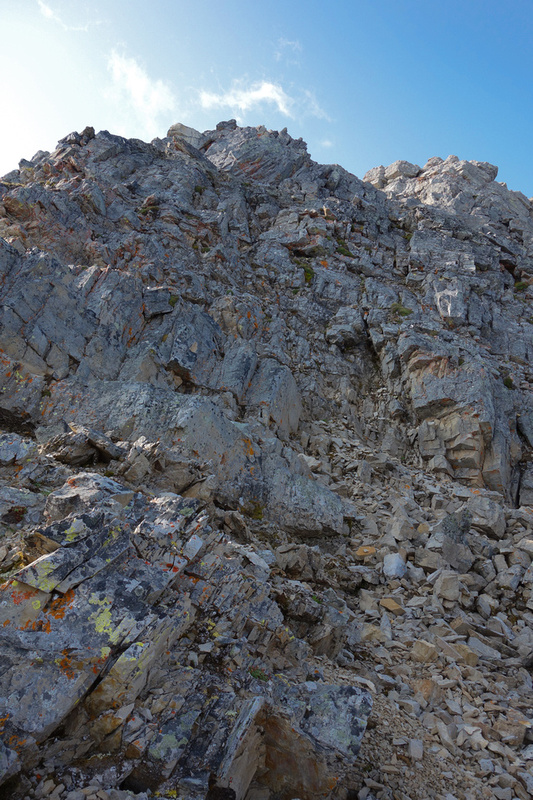 It goes, but not easily and there are countless loose holds ready to throw you off the mountain. 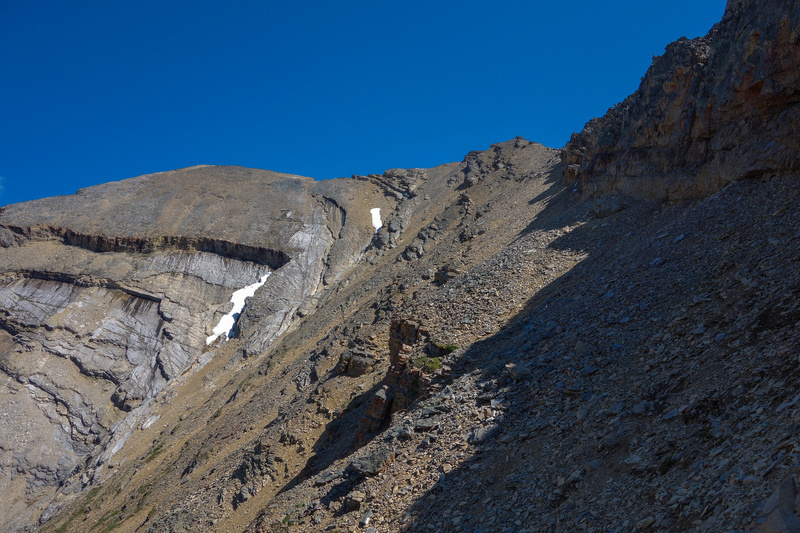 Also, with more than one person you’re going to run into rock fall issues while descending the west slope route. Looking back at a section of ridge just under the summit of Kent Ridge - loose! From the summit of Kent Ridge the traverse over to Inflexible doesn't look that involved. 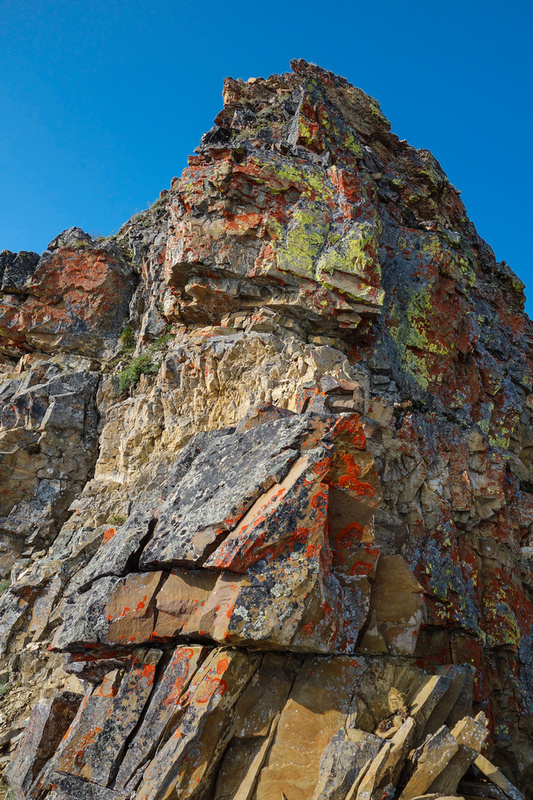 More colorful rock - steep scrambling. 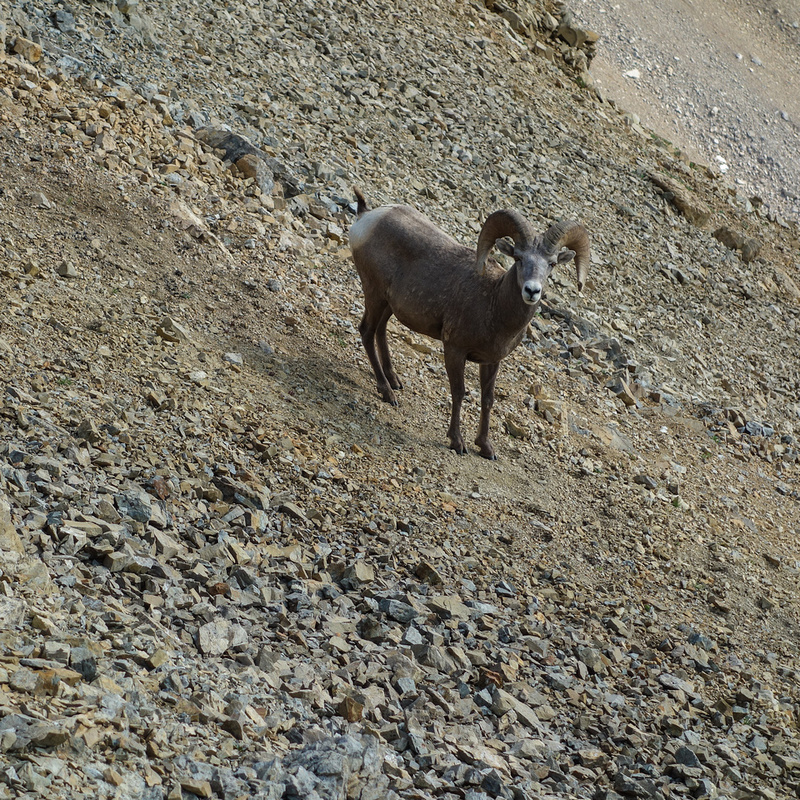 A beautiful big horn sheep on the descent from Kent Ridge towards Inflexible. Looking back at the ridge from near the col.
You can see the steepness and looseness of the terrain here, looking at the twin summits of Inflexible as I near the col, side-slopping on climber's left. 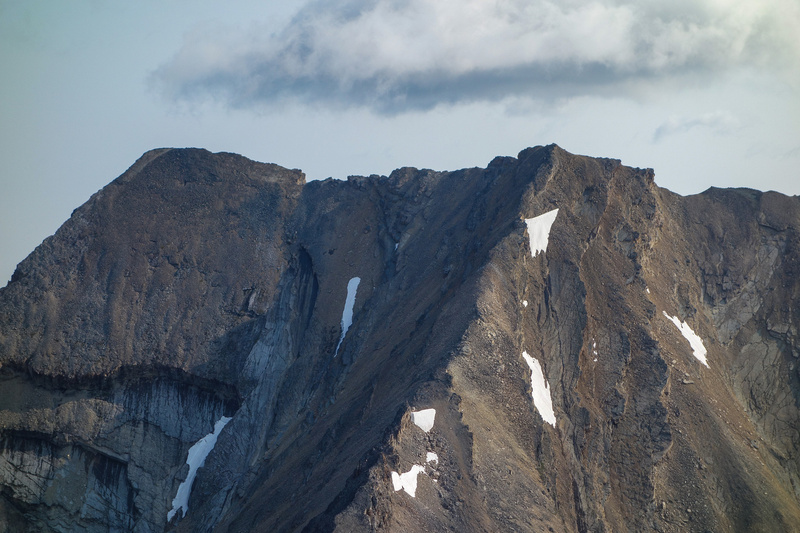 Side slopping towards the col - avoiding obvious rotten cliff bands. 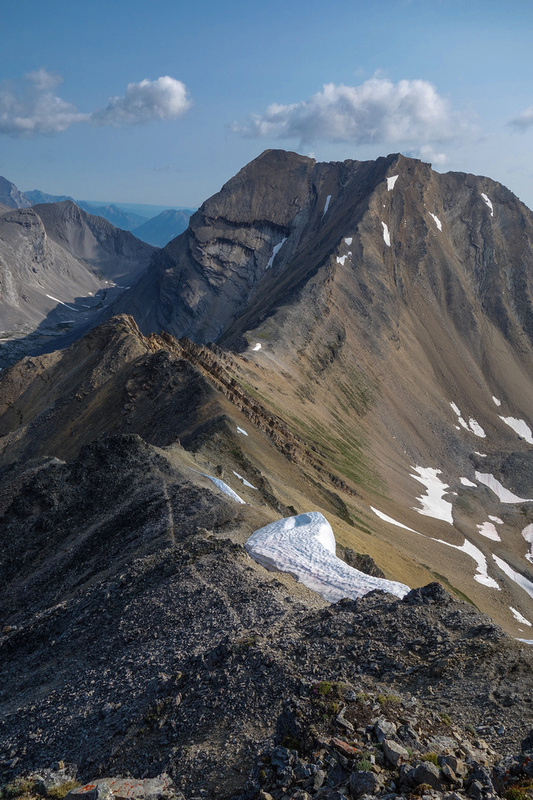 Looking back at Kent Ridge along the scree bench to the west of the ridge crest that I used to make my life easier (and safer!). Looking down at the tarn and the James Walker valley. The descent lines look good from here, but you can see it gets steeper the further down you go. The ascent to Inflexible is as easy as it looks. 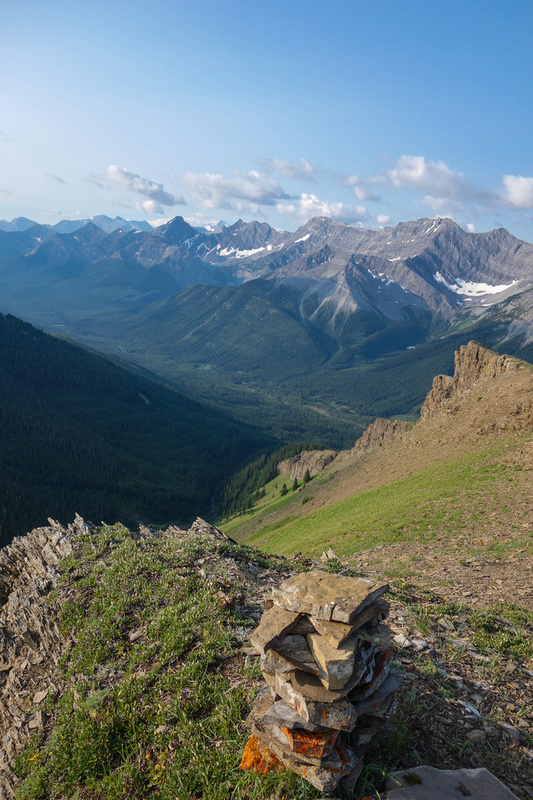 Great panorama of the pristine Kent Creek Valley nestled in between Mount Lawson (left) and Kent Ridge (right). 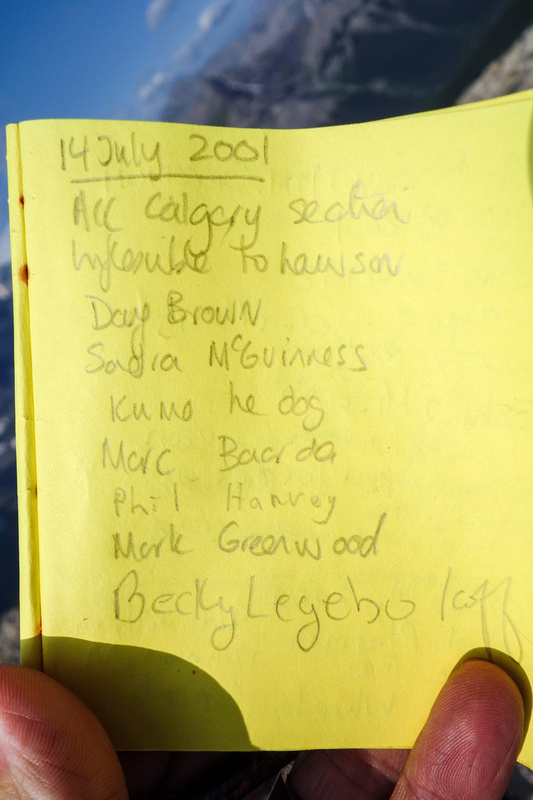 Some familiar names in the summit register. 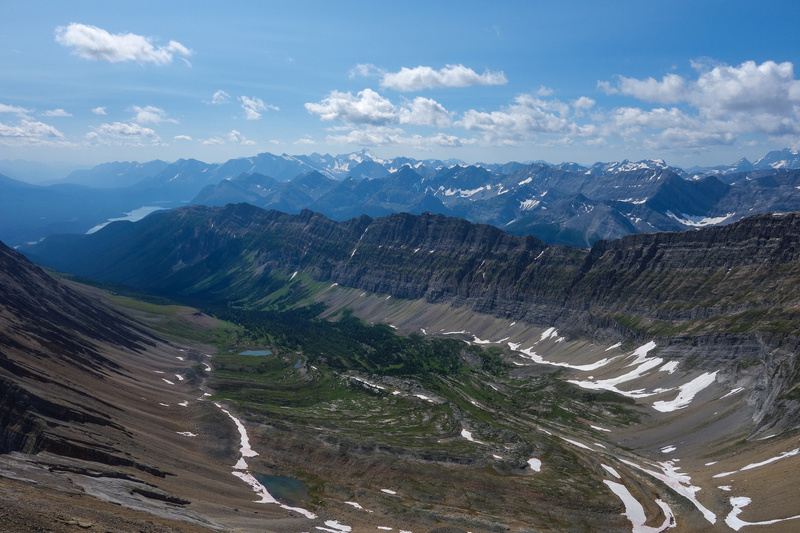 Another view of the pristine Kent Creek Valley - this time right from the summit and even including James Walker Tarn at lower right. Looking at the north summit - with James Walker behind. Highway 40 and Mount Lawson look pretty small from here! 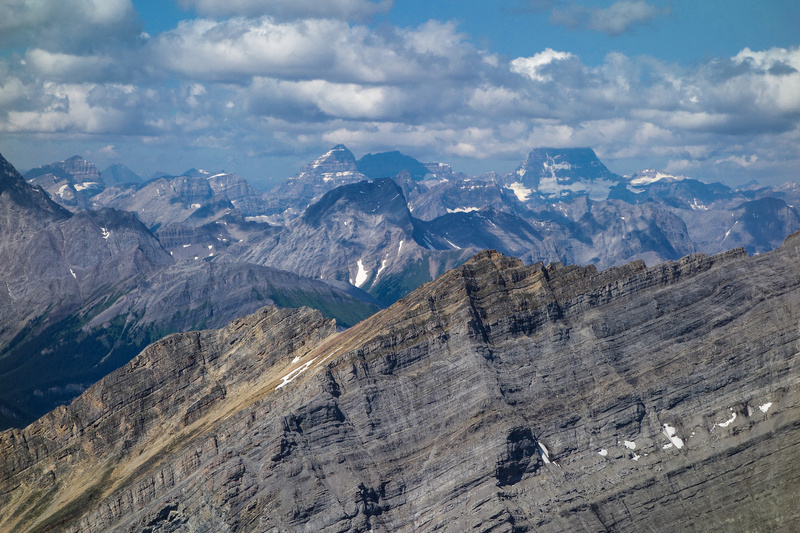 Mount Assiniboine makes a partial appearance with Eon and Aye to its left and Smuts in the foreground at center. Mount Sir Douglas with Mount French in the foreground. 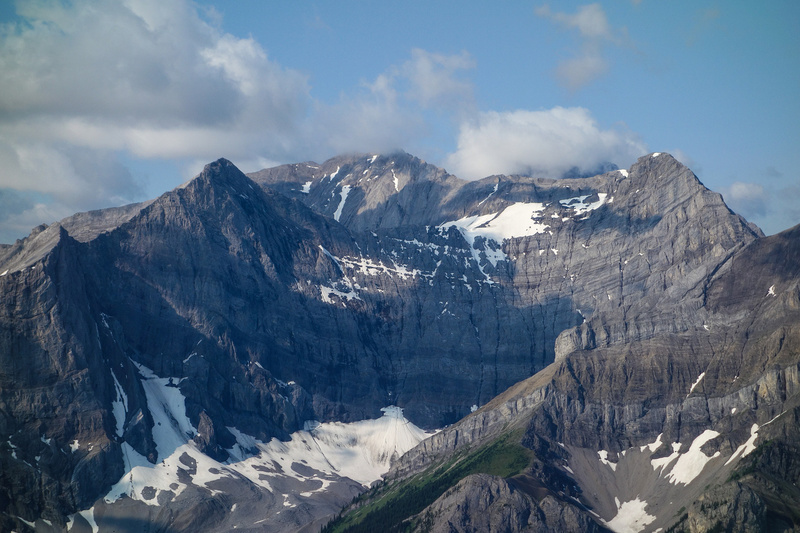 Mount Joffre looms over peaks such as Lyautey, Black Prince, Marlborough and Warspite. Mount Lawson and part of the difficult connecting ridge. Lots of small tarns in the Kent Creek Valley which must be heaven for wildlife since humans pretty much can't access it! 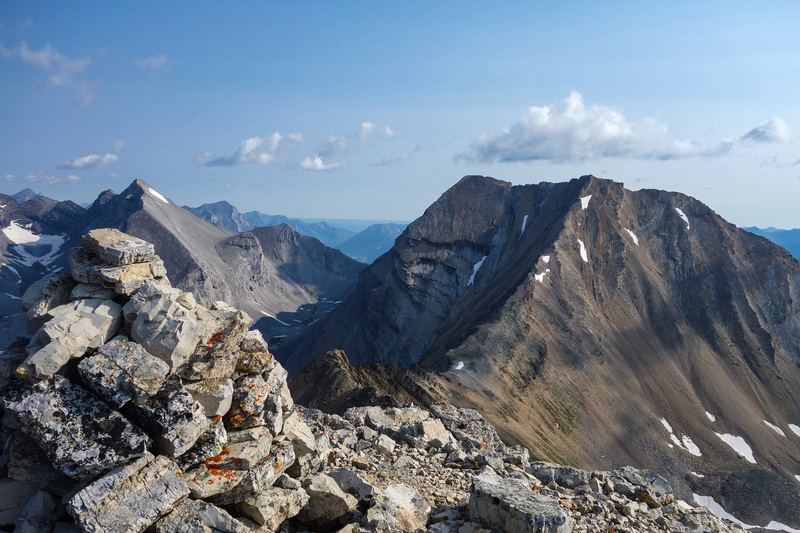 View off the summit towards Kidd North, Spoon Needle, Limestone, Wedge, Opal Ridge (L to R). I traversed ledges and scree ramps back and forth on the west face with gorgeous views of the James Walker Tarn below. 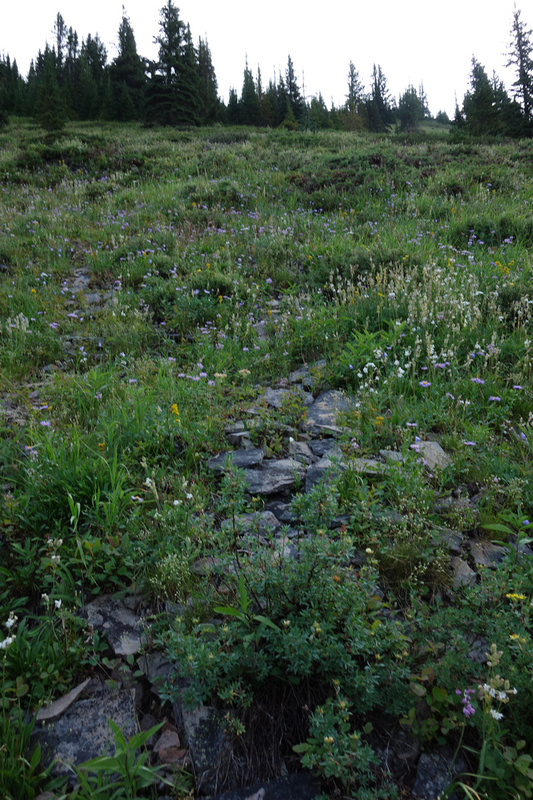 Lots of wildflowers on the scree slopes under the west face. Looking towards James Walker. Looking back at the descent route from Inflexible. 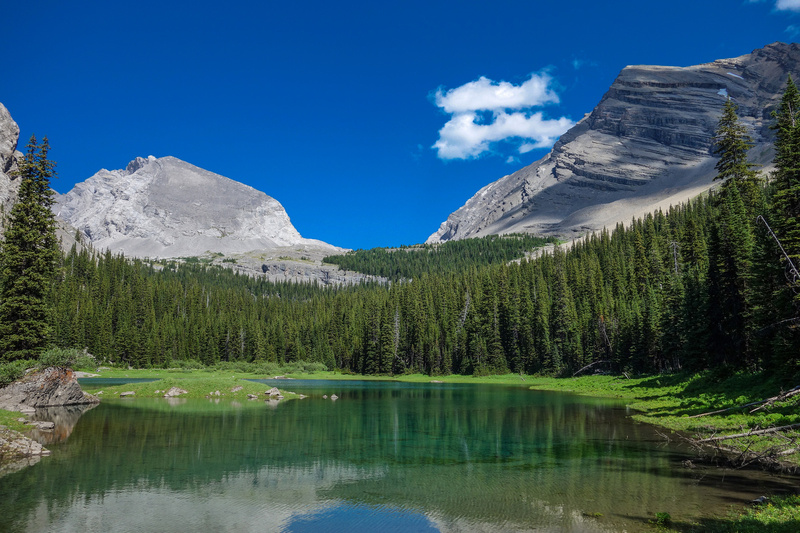 The tarn area is worth hiking to on its own.Looking back at James Walker (left) and Inflexible (right) from the tarn. Hiking out along James Walker Creek.